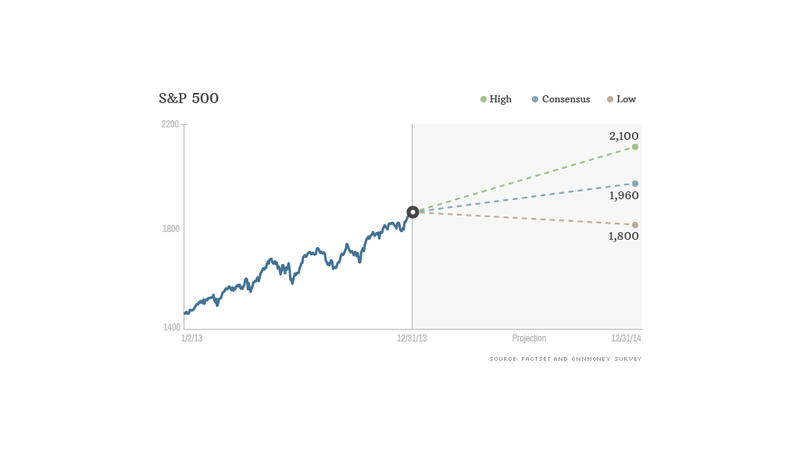 Experts surveyed by CNNMoney expect the S&P 500 to finish 2014 at 1,960, up 6% for the year. After sprinting in 2013, the bulls are looking a little tired this year. Most experts believe the bull market in stocks will continue for a sixth year in 2014, but they expect the gains to be more modest. According to 30 investment strategists and money managers surveyed by CNNMoney, the S&P 500 should finish 2014 at 1,960, up 6% for the year. While that's a healthy gain, it's a far cry from 2013's 30% increase. Then again, few expected stocks would rise as much as they did in 2013. 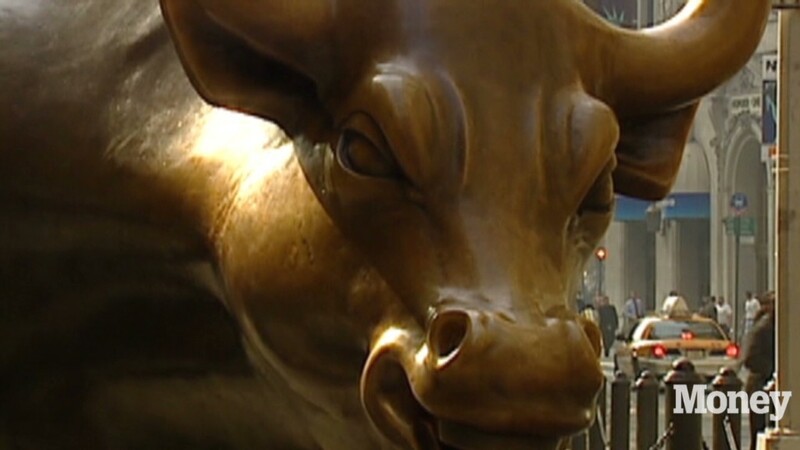 CNNMoney's survey of experts a year ago predicted a 5% rise in stocks for 2013. Even the most bullish forecast for a 27% run-up slightly missed the mark. A slowing global economy could weigh on U.S. corporate profit growth. Without strong earnings, investors may not be willing to pay as much for stocks, especially since the market is already trading at a premium, said Kim Forrest, senior equity analyst at Fort Pitt Capital. By the end of 2013, stocks were valued at more than 15 times earnings estimates for 2014 -- higher than both the 5-year and 10-year average. Tech, financial stocks could stand out: Through the broader market is looking a little frothy, experts are more bullish on stocks in the technology and financial sectors, as both boast attractive valuations. Plus, experts believe tech companies could benefit as companies spend more on technology upgrades to increase productivity. And even though financial stocks had a great run in 2013, experts think they'll continue to outperform as interest rates rise ... which should boost banks' profitability. Individual investors are the wild card: Brad McMillan, Chief Investment Officer at Commonwealth Financial Network, said he does not believe stocks should go much higher based on their fundamentals. But that may not matter if individual investors continue to flock back to stocks. After shunning stocks after the financial crisis of 2008 and early 2009, individual investors began tiptoeing back into the stock market in 2013. They poured more than $19 billion into U.S. stock market mutual funds last year, while yanking nearly $80 billion out of bond mutual funds, according to Investment Company Institute Data. While this is a significant shift from previous years, it's only a drop in the bucket. During the five year span from 2008 to 2012, investors took out more than $500 billion from stocks and plowed more than $1 trillion in bonds, ICI data shows. So if 2014 turns out to be the year when the so-called "Great Rotation" of money from bonds to stocks really takes place in earnest, then the market could wind up doing much better than expected.